In A French Town, Voters Try To Make Sense Of An Election Race Like No Other : Parallels The scandals and party infighting in this year's French presidential election have left voters unsure about which candidate to vote for. "Many people don't even want to vote," says farmer Erwan Humbert (right), 44, working in his field in Longpont-sur-Orge. "And they don't want to hear about politics anymore." As Erwan Humbert turns his tractor off and climbs down from the seat, the rumble of a motor gives way to the twittering of birds. The scent of fresh earth fills the air. This baby-faced farmer, with his long, dark hair pulled back into a ponytail, used to be an engineer. 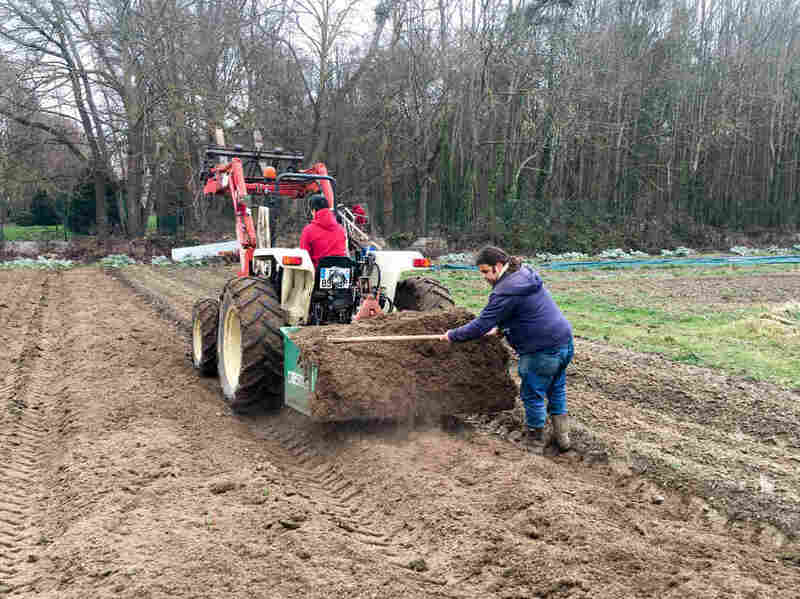 But the 44-year-old traded in his job in Paris' business district to grow organic vegetables in the countryside. Humbert says he makes a good living, and most of all, he's happy. "I might not earn as much as I used to," he says, "but I'm my own boss and now I can listen to the sound of the birds." Humbert, like most residents in the town of Longpont-sur-Orge, is astounded by this year's presidential election. The race is like no other. The two traditional mainstream parties have been upended, leaving more extremist and inexperienced candidates to take the lead. Party infighting has left people feeling uncertain. Less than six weeks before the first round of voting, this presidential election is still up in the air. Longpont-sur-Orge, population 7,000, is about an hour's drive south of Paris. Part rural, part town, it's far enough beyond the Paris suburbs to have its own outlook and vibe. And it's definitely outside the political fishbowl of the French capital. Since medieval days, the town has been a stop along the pilgrimage route to Compostela, Spain. Its 11th century basilica dominates the town square. Mayor Philippe Hamon, who represents a small, center-right party, says this is a town of moderate professionals who initially lined up behind the mainstream conservative candidate, Francois Fillon. But Hamon says allegations that Fillon used taxpayer money to create a fake job for his wife have not gone down well. And that could change things. "I'm getting echoes that a large proportion of voters — maybe 50 percent — could be tempted to vote for [Marine] Le Pen," he says. Hamon calls that a worrying sign. 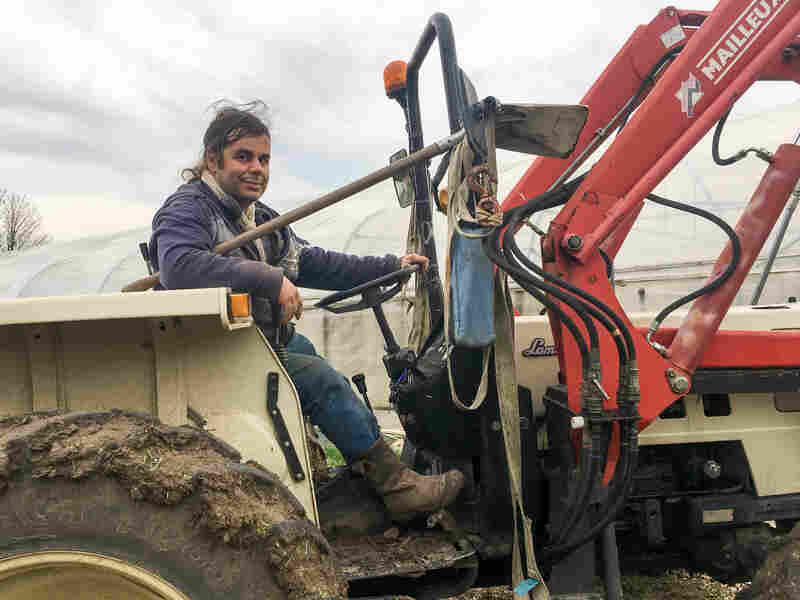 Erwan Humbert, 44, left Paris to be a farmer in Longpont-sur-Orge. He says he is undecided in France's upcoming election. Le Pen, the country's anti-immigration, far-right candidate, is currently leading the polls. But just barely. Emmanuel Macron, a 39-year-old former economy minister and political newcomer running as an independent, is neck-and-neck with her. Polls say he would beat her in the second-round runoff, which determines who will be president. But Hamon says people are a bit suspicious of Macron because he served in the government of unpopular Socialist President Francois Hollande. Macron stepped down in August to launch his own political movement, which he calls progressive. The name of his party, En Marche!, means On the Move. Macron says France is stuck between the old ideologies of left and right that don't mean anything in today's world. He wants to revolutionize France. Hamon believes the frenzy around Fillon and the allegations that his wife had a fake job could have been stoked by the media for the benefit of Macron, whom many politicians accuse the French media of favoring. 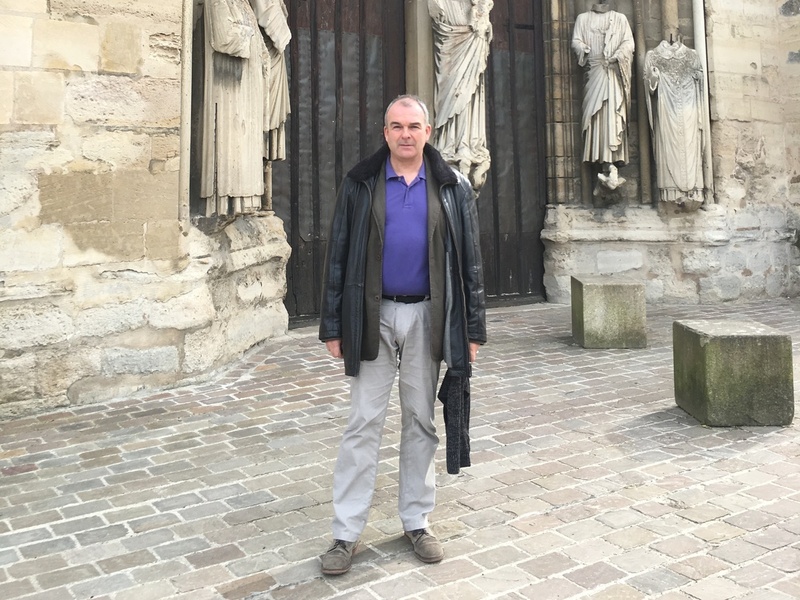 As he takes me into his town's 11th century basilica to see the impressive collection of saints' relics, one of the largest in France, an organ is playing. Its massive pipes cover an entire wall. Michel Poillot, the organist for 45 years, says he can't decide whether he will stick with Fillon, who was the front-runner before the scandal. Poillot is trying to make sense of what he reads, sees and hears on the news. "Sometimes we wonder about the role of the French media in this jobs scandal," he says. "But we can't exactly verify the facts. It's all very complicated." At lunchtime, one of the town's main restaurants, l'Origan, is packed with young professionals and retirees. Despite what the mayor says, it's difficult to find a Le Pen voter here. Jean Seguin, a 32-year-old engineer, works at the nearby Caterpillar plant. "I'm voting for Macron because I think he incarnates renewal," he says. "We need change. We've got to break with these same people who run against each other for president every five years." "I'm getting echoes that a large proportion of voters – maybe 50 percent – could be tempted to vote for [Marine] Le Pen," says Mayor Philippe Hamon, who represents a small, center-right party. Hamon says it's a worrying sign. Retired floral shop owners Patrick and Monique Letter are tucking into hamburgers, one of the restaurant's specialties. They say this election is not about voting for someone but rather about voting against someone. For them, that's Le Pen. "She's our Donald Trump," Patrick Letter says. "And we have to pick the candidate who has the best chance of beating her," his wife adds. Macron is the man to do it, they believe, despite his lack of experience. But Monique Letter says a lot of her friends are voting for Le Pen. The couple says France is a wonderful place to live, and the European Union is one of the best things to happen to the country. And Le Pen, who opposes the EU, would destroy that, they fear. "She would bring this country to the ground, just like your president is doing with your country right now," says Monique Letter, referring to Donald Trump. Not far from the restaurant, a sprightly looking Odile Dupuis is walking down the street, heading to the bakery when I stop her to ask a few questions. The octogenarian doesn't look anywhere near her age, but she still refers to herself as old. "I have always voted but I've never seen anything like this," she says. "I feel like I'm watching a film." Dupuis says all the turmoil is very serious, but at the same time it's a sign that a complete and total change is coming about. So who is she backing? "It's not really polite to ask that question," she responds. Back in his freshly plowed field, farmer Erwan Humbert says he will definitely be casting his ballot, but he still doesn't know for whom. He's never seen people so confused. "Many people don't even want to vote," says Humbert. "And they don't want to hear about politics anymore." An earlier Web version of this story misstated farmer Erwan Humbert's age as 32. He is 44.